PSYCHIC BLUES IS NOW ON SALE! Feral House’s newest release comes to you from Mark Edward, a professional mentalist who specializes in magic of the mind. 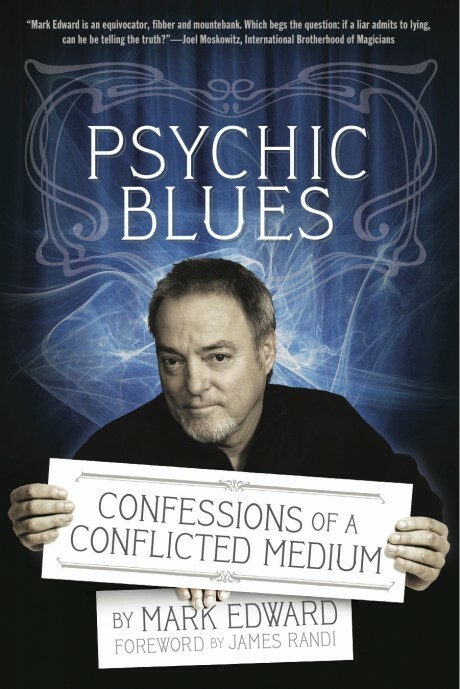 In his book Psychic Blues: Confessions of a Conflicted Medium he comes clean about his years of exploiting believers and reveals the methods of a psychic scamster. He has worked at Hollywood’s famed Magic Castle, ran 900 psychic lines, was chosen as the Psychic Friends Network’s “greatest psychic in the world,” and is also on the editorial board of Skeptic Magazine. Featured on A & E, NBC, Discovery and Sci-Fi channels he has finally written a cohesive tell-all that is at once confessional and instructional regarding human belief and those who exploit it. We are very excited for this release and will keep you abreast on Edward’s forth coming tour and events. If you are in the Vegas area this weekend or looking for a summer vacation you can check Mark out at the TAM festival of science, skepticism and critical thinking. For more insider info like the book’s Facebook page HERE! Read about the author’s work HERE! And most importantly pick up a copy of the book HERE! The book will not be available from stores or Amazon for a few more weeks but the answers to your psychic questions can be sent to you now from Feral House directly! Sometimes magicians do reveal their secrets…. THE TRAILER FOR BLOOD BENEATH MY FEET IS HERE! Our videographer Robin Stein has made another beautiful trailer for us. Check out the video for Blood Beneath My Feet: The Journey of Southern Death Investigator below.